A man’s heart plans his way, But the Lord directs his steps.…There are many plans in a man’s heart, Nevertheless the Lord’s counsel—that will stand.…A man’s steps are of the Lord; How then can a man understand his own way? I can hardly believe I’m writing this devotion. I’m a bad person to write it because I hate being interrupted. But even practically speaking, I can’t believe I’m writing at all! I’ve sat down at least a dozen times over the past week to write this very devotion, but have been prevented from it, again and again, due to the needs (and intense wants) of little people in my home. Every mom knows what it’s like to have her plans interrupted. It happens so often, it’s actually astounding that we even make plans anymore! But, whatever we might expect from this day, this hour, this moment, God has known from eternity what it would truly hold. It’s no surprise for Him. He has prepared, in advance, a good work for us to do: serving our closest neighbor, His children, just as He has served us. When we lose our life (or plans!) for Him, we find what He prepared for us all along (Mark 8:35). Despite any difficult or strenuous change of plans, cling to your Savior and His Word. 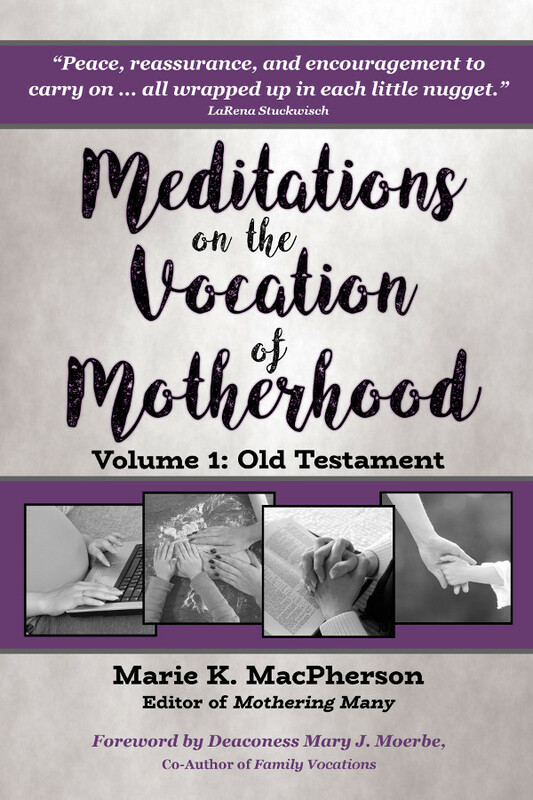 Excerpted from Meditations on the Vocation of Motherhood, vol. 1: Old Testament (2018), by permission of the author.